The paved portion of the Mattapoisett Rail Trail ends at Mattapoisett Neck Road now, but, thanks to a state grant, this section to the YMCA property, will be paved this year. Photo by Glenn C. Silva. The Massachusetts Department of Transportation (MassDOT) has announced that DW White is the apparent low bidder for its upcoming project to build a shared-use path in Mattapoisett. The path will accom­modate bicyclists and pedestrians and will extend from Mattapoisett Neck Road to Depot Street. 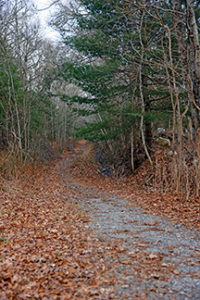 The Mattapoisett Rail Trail con­nects to Fairhaven’s Phoenix Bike Trail just east of Shaw Road at the Shaw Farm Trail. This new path will be the next phase of the connection that currently exists heading west through Mattapoisett and Fairhaven, terminat­ing at the Fairhaven/New Bedford Harbor. Bids from ten contractors for this project were opened on Tuesday, January 8, with the lowest bid from DW White being $6,645,395.44. As per policy, MassDOT will now review the bid prior to issuing the Notice to Proceed for work. Since 2015, the Baker-Polito Administration has constructed or funded 150 miles of paved trails, adding to the current statewide inventory of 565 miles of paved trails. Over 30 miles of trails spanning over a dozen projects were completed across the Common­wealth in 2018. In 2017, Governor Baker estab­lished an Interagency Trails Team which is led by the Governor’s office and is comprised of staff from MassDOT, the Executive Office of Energy and Environmental Affairs and the Department of Conservation and Recreation (DCR). The purpose of the team is to help develop a unified vision for a trails network and translate that into strategic investments, policy innovation to facilitate the develop­ment of trails, and an enhanced relationship with municipal partners. The Baker-Polito Adminis­tra­tion in fall 2018 also an­nounced the MassTrails Pro­gram, an inter­agency initiative that will provide funding and resources to municipal and public entities in order to expand and connect networks of off-road, shared-use pathways and recrea­tional trails for all users across Massachusetts. 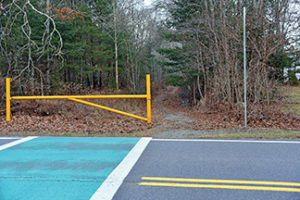 The MassTrails Program will provide a total of approximately $5 million in matching grants through the first round of funding in Fiscal Year 2020 and will also offer technical assistance and resources to individu­als, municipalities, non-profits, and other public entities to design, con­struct, and maintain high-quality Massachusetts trails. The grant application for the MassTrails Program is now available and more information can now be found on the new public website: https://www. mass.gov/welcome-to-masstrails. MassDOT’s 5-year Capital Investment Plan (CIP) sets aside $180 million for multi-use pathways as well as $60 million for high-priority projects through the statewide Pedestrian and Bicycle Plans that are currently being completed.